The Aldershot bombing was an attack by the Official Irish Republican Army (Official IRA) using a car bomb on 22 February 1972 in Aldershot, England. The bomb targeted the headquarters of the British Army‘s 16th Parachute Brigade and was claimed as a revenge attack for Bloody Sunday. Seven civilian staff were killed and nineteen wounded. It was the Official IRA’s largest attack in Britain during “the Troubles” and one of its last major actions before it declared a ceasefire in May 1972. The Northern Ireland riots of August 1969 marked the beginning of the conflict known as the Troubles. To help restore control after the Royal Ulster Constabulary (RUC) had lost it, the British Army was deployed on the streets of Northern Ireland. In December 1969, the Irish Republican Army split into two factions – the Official IRA and the Provisional IRA. Both factions’ retaliation against the British Army during the Falls Curfew resulted in sustained campaigns against the security forces. 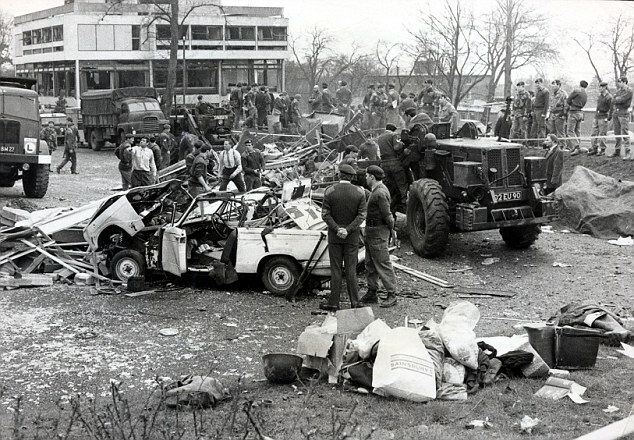 The target of the Official IRA bomb was the headquarters of the 16th Parachute Brigade, elements of which had been involved in the Bloody Sunday shootings. Despite warnings, the ‘open’ garrison meant there was no security or controlled access to the camp. A Ford Cortina car containing a 280 pounds (130 kg) time bomb was left in the car park, deliberately positioned outside the officer’s mess. The bomb exploded at 12:40 pm on 22 February, destroying the officer’s mess and wrecking several nearby Army office buildings. The soldiers who were the intended targets were not present, as the regiment itself was stationed abroad and most staff officers were in their offices rather than the mess. Nonetheless, seven civilian staff were killed five female kitchen staff who were leaving the premises, an elderly gardener, and Father Gerard Weston (a Roman Catholic British Army chaplain). John Haslar (58), the cleaner Jill Mansfield (34); a mother of an eight-year-old boy; as well as four other cleaners named Thelma Bosley (44), Margaret Grant (32), Cherie Munton (20) and Joan Lunn (39). “Any civilian casualties would be very much regretted as our target was the officers responsible for the Derry outrages”. The Official IRA also said that the bombing would be the first of many such attacks on the headquarters of British Army regiments serving in Northern Ireland. 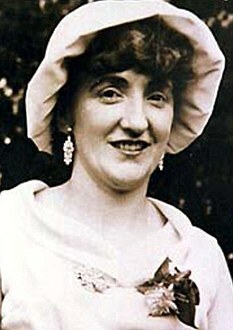 Killed in bomb attack on British Army (BA) base, Aldershot, England. Civilian employed at the British Army (BA) base. As the bomb had killed only civilian staff, the Official IRA received harsh and widespread criticism. On 29 May 1972, the Official IRA’s leadership called a ceasefire and stated that it would only launch future attacks in self-defence. 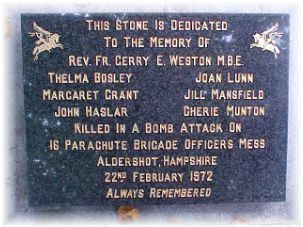 The Aldershot bombing was believed to have been one of the factors that led to this decision. In November 1972, an OIRA volunteer, Noel Jenkinson, was convicted for his part in the bombing and received a lengthy jail term, dying in prison of heart failure four years later.